The darkening of certain inks over time is often attributed to sulphuretting, where lead compounds react with pollutants such as sulphur dioxide in the atmosphere. 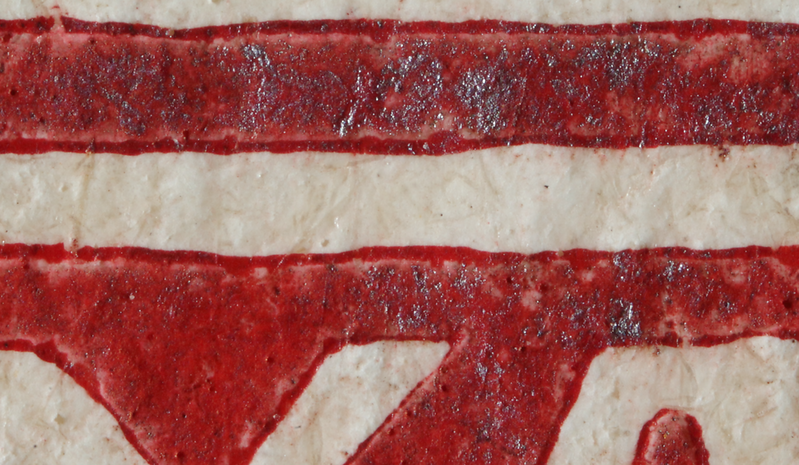 There is, however, another process of darkening in red inks made of mercuric sulphide (HgS), commonly known as vermilion or cinnabar and often found in old paintings. Remarkably, cinnabar has also been a Chinese medicine for almost 2000 years. Almost 50 Chinese medicines still contain cinnabar, including infant sedatives (Huang et al. 2007, Liu et al. 2008, Yen et al. 2008). Experiments have shown that HgS pigment on paper can react with salt (NaCl), possibly deposited by fingers, to form the compound Hg3S2Cl2, which on exposure to light decomposes into white mercuric chloride (Hg2Cl2), sulphur (S) and a black form of HgS called metacinnabar (National Gallery Company 2002). 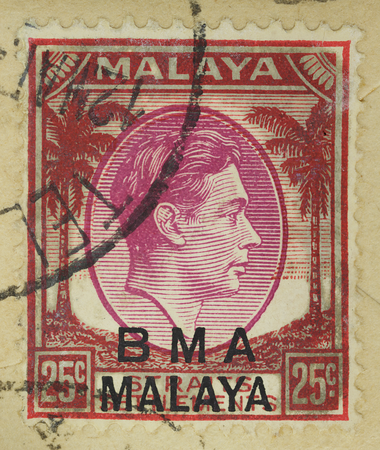 Using Raman spectroscopy, the ink used for the BMA MALAYA $2 duty plate shown above was identified as vermilion (Lin 2018c). 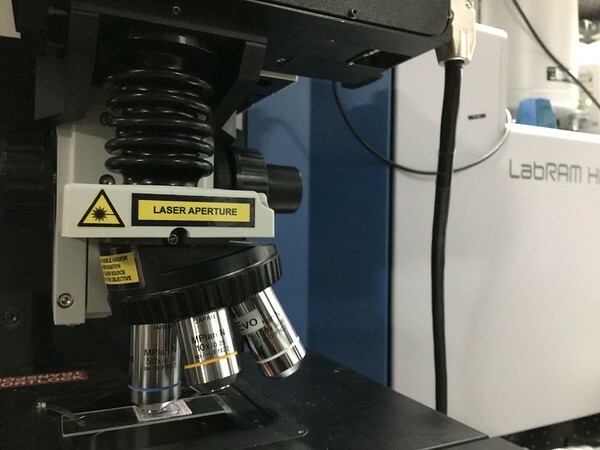 The ink was irradiated with a 785 nm infrared laser through a 50× microscope objective to precisely target the area of interest, using a HORIBA Scientific LabRAM HR Evolution Raman microscope calibrated with a 585.25 nm neon-argon-hydrogen discharge and a wafer of pure silicon. 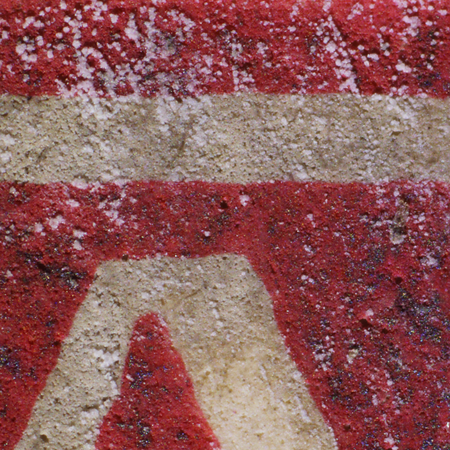 The laser power at the surface of the stamp was 414 μW. Raman scattering was dispersed through a diffraction grating of 1800 grooves mm−1 and collected by a charge-coupled device sensor cooled to −120 °C (top right corner of photo) to reduce noise in the signal. 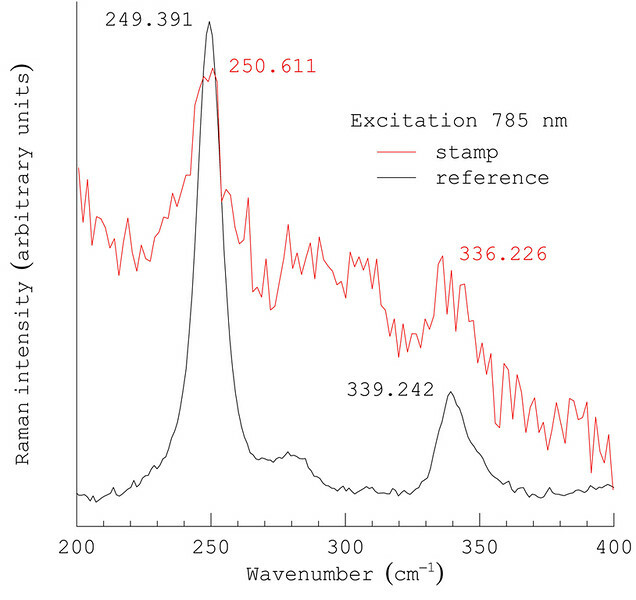 Raman spectrum (red) of a single sample of the red ink, stretched along the y-axis to accentuate the peaks (download raw data). It closely matches a reference spectrum (black) of mercuric sulphide in the spectral library of Caggiani et al. (2016). A separate Raman spectrum of an uninked part of the stamp did not have these peaks. These white and black deposits could be mercuric chloride and metacinnabar. 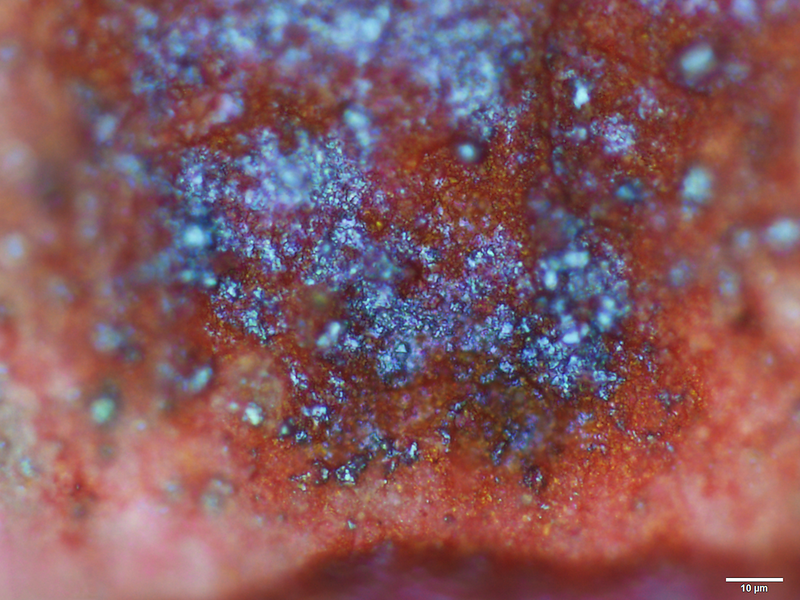 Photomicrograph showing possible deposits of white mercuric chloride, black metacinnabar and yellow sulphur particles. Imaged using a plan semi-apochromat microscope objective and charge-coupled device sensor with Peltier thermoelectric cooling and 14-bit analogue-digital conversion. 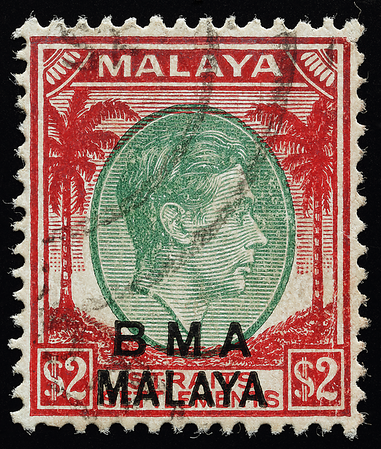 In the past, many collectors tried to clean up their blackened stamps using talcum powder. Unfortunately it doesn't help at all and causes further damage in the form of an oily deposit. I am especially grateful to Lester Kok, Zhang Lulu, Xiong Qihua, Lim Kim Yong and Eddie Yong for their contributions to this article.